When Elsa is at preschool, David and I sometimes drink our meals instead of eating them. Spinach, avocado, sprouts, pear, lime and pumpkin seeds might sound like a delicious salad to most people. But add a splash of plant milk and some ice and you have turned it into a creamy and groovy green shake. The advantage is not only that it’s quicker to prepare and easier to consume. It also comes with endless possibilities and variations. Add a banana and some extra hemp powder and it’s perfect after a workout. Don’t have almond milk at home? Not a problem, try coconut milk instead. There are no limits or rules. Smoothies have become a way for us to keep a few of our meals lighter and simpler (which can feel very nice when you work with food all day, like Sara also pointed out). Smoothie can be our breakfast, lunch or anything in-between. And it’s always our first choice after working out. 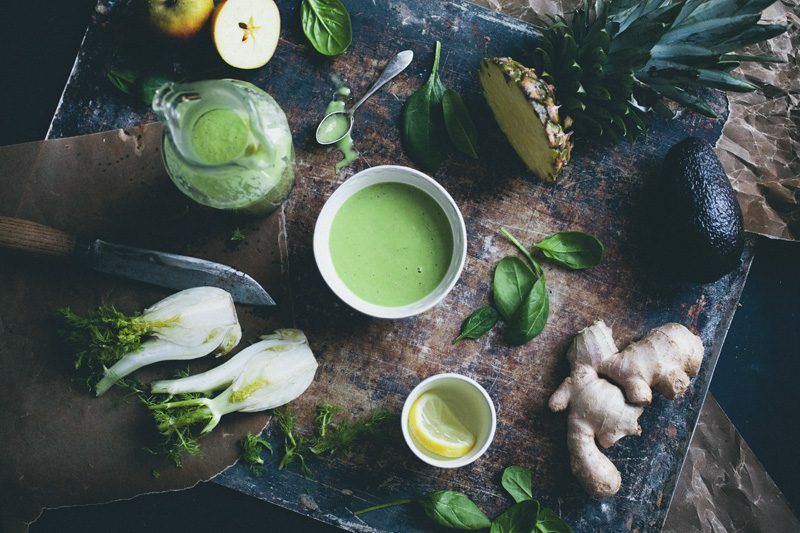 If we are on a detox, a smoothie can even be a pretty fulfilling dinner. 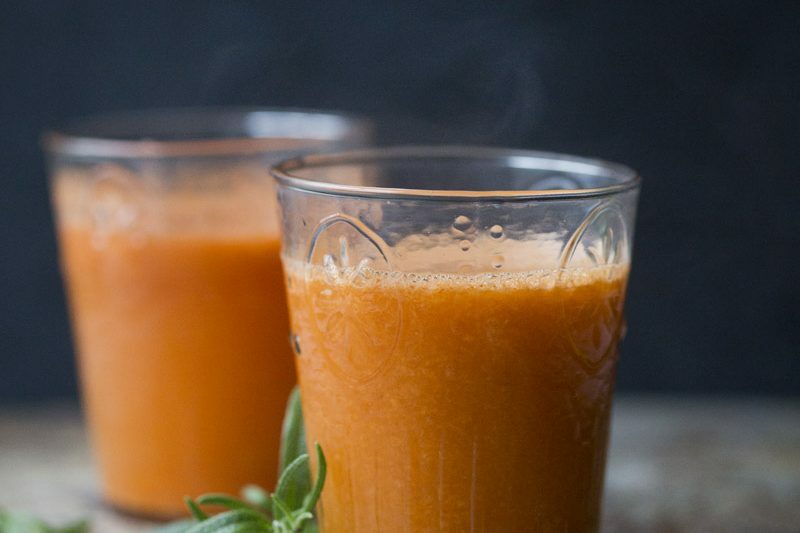 The smoothies we mainly talk about today differ from the ones you often find on dessert menus in restaurants, as these have vegetables in them. They still have a sweetness to them, but are more nourishing. It truly is a meal in a glass. Call us bananas, but we actually prefer to choose ingredients for our smoothies depending on color. It feels a bit more civilized not drinking a brown mess (unless it’s a cacao smoothie). Keeping your smoothies in color scale is not only pretty, but also one of the easiest way to keep track of their health benefits. The colors of fruit and vegetables are directly connected with what nutrients they are rich in. It’s always good to eat (and drink) plants with lots of color, as the color is an indicator that they are rich in the natural chemicals phytonutrients, that help prevent disease and keep your body working properly. So, searching for these disease fighting components is not difficult at all, simply go hunt for colors. The specific colors also indicates what minerals, vitamins and phytonutrients they are rich in. 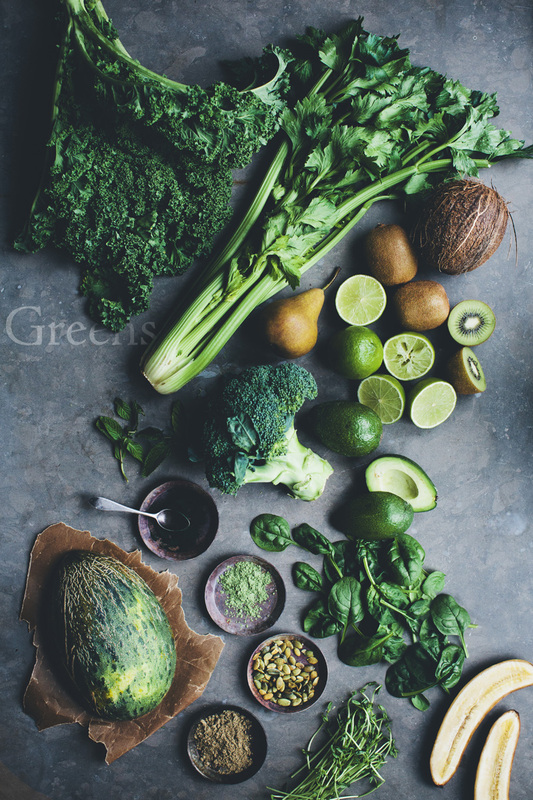 Dark green vegetables are for example rich in iron, carotenoids and chlorophyll. Yellow and orange fruit are rich in vitamin C and flavonoids. 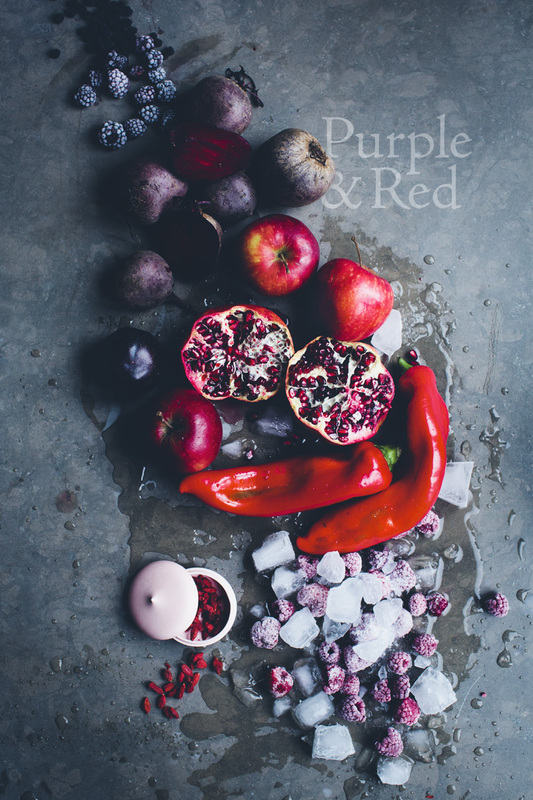 Red and purple vegetables and fruit contain anthocyanins and lycopene. So try to vary different colors on different days for best result. 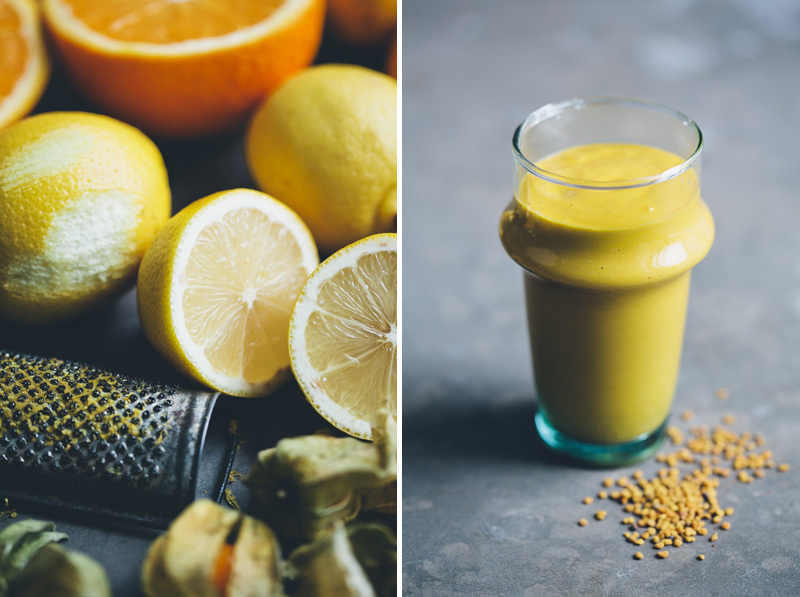 Another secret behind a good, nutritious and nourishing smoothie is to find a balance between fruit, vegetables, proteins (nuts or nut butter, seeds and protein powders), spices and add-ins (spirulina, turmeric, bee pollen, etc.). Try to make sure that you have something from every category for best result. And make sure to choose organic ingredients if you can find and afford it. Nitrogen rich vegetables like beetroots increases the blood flow to the muscles, which means that you get more energy and better performance when you are working out. Cool right!? Mix all ingredients in a blender until smooth. Add more liquid if it feels too thick. Celery and banana are rich in the electrolytes Sodium and Potassium (which you loose when you sweat). 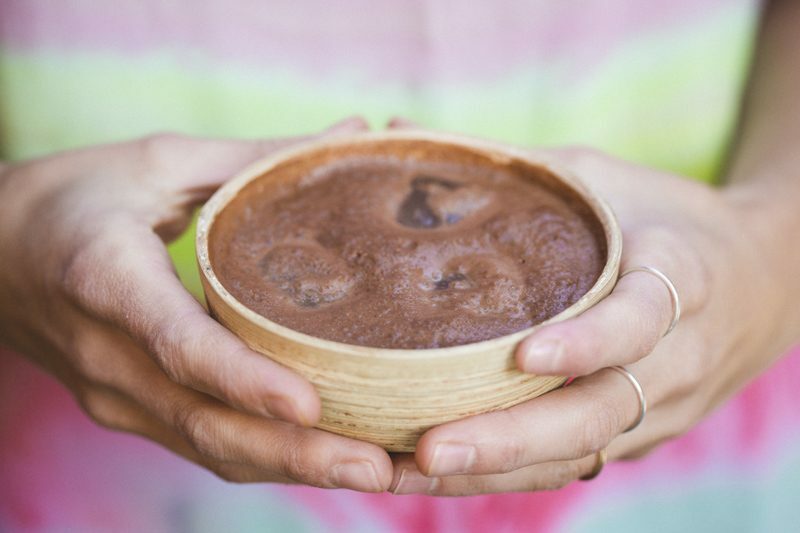 Together with the proteins in the hemp powder and nut butter, they are the perfect ingredients in a recovery drink. 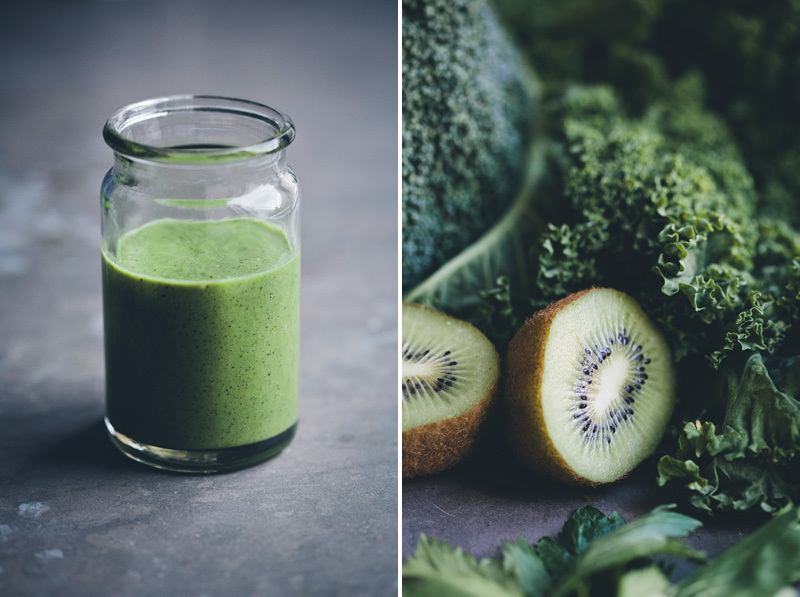 Keep hydrated and drink this Green Recovery Smoothie after a workout for best result. Mix all ingredients in a blender with a few ice cubes until smooth. 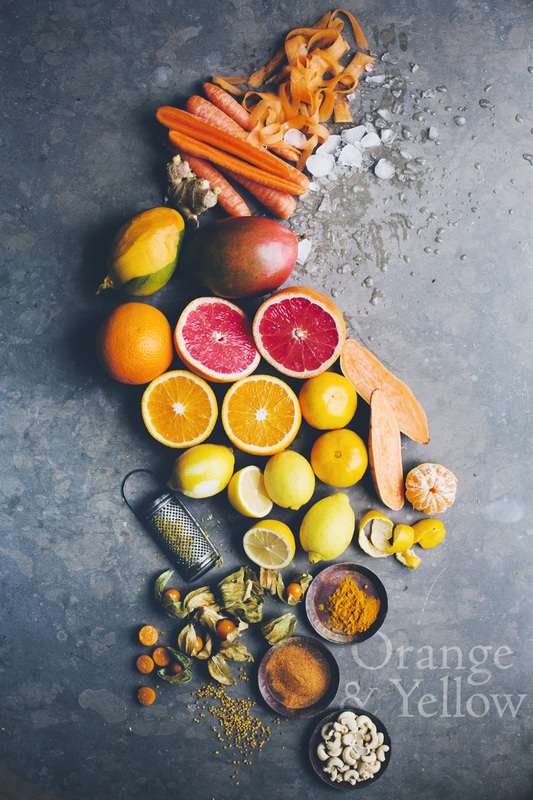 Vitamin C is found in citrus fruit, rosehip and mango, and is in fact a strong antioxidant, helping repair and protect the cells in our bodies. 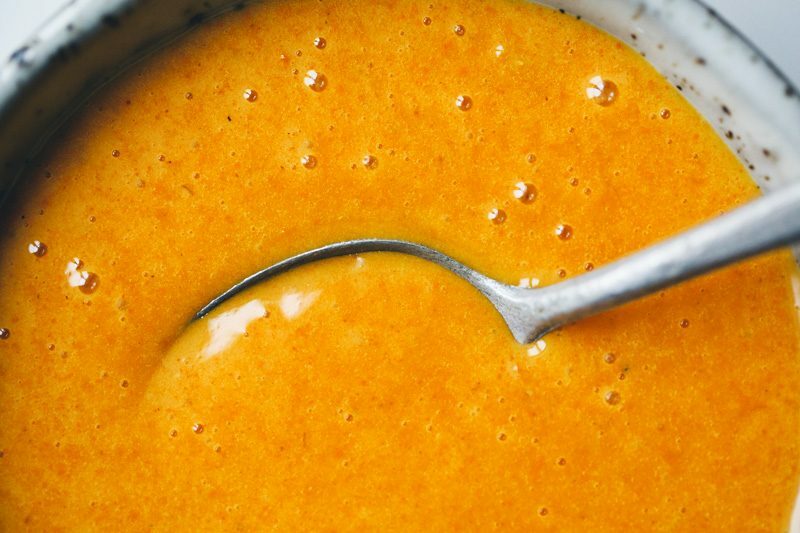 Turmeric has highly anti-inflammatory and healing properties. Add 1 tsp to your daily routine. Mix all ingredients in blender with a few ice cubes until smooth. If you follow us on Instagram (David | Luise) you can find several more smoothie recipes and tips. Precious work you beautyful family.... congratulations! The pictures are soooo lovely. Looks like art :) love the recipes too. A couple days ago I made a shake with carrots and apple and raspberries. So thanks for the inspiration. Great post! 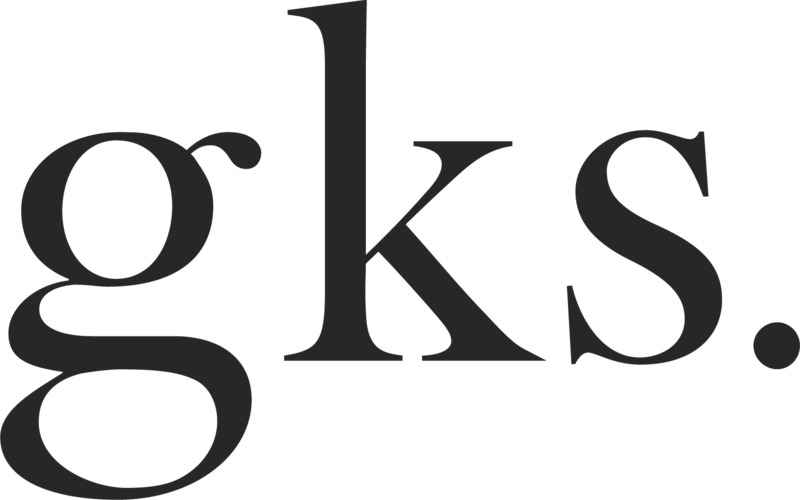 Stunningly beautiful photos and great recipes. Look forward to trying some. 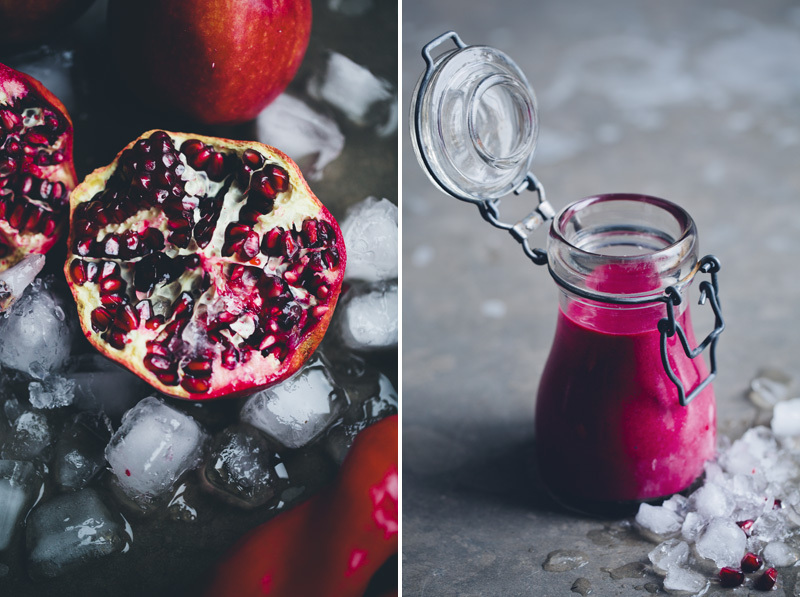 Thanks for these gorgeous, inspiring smoothies. It is really refreshing to substitute lunch with a smoothie every now and then. I have spinach growing in my garden, time to put it to good use - but not around my parents...they'd think I'm nuts if they see me 'drink' spinach and kale! STUNNING photos as always. And you can never go wong with a smoothie... can't wait to try some new combinations. Thanks! This is one of the most beautiful food posts I've ever seen, and the most useful, because, looking at people and what they eat every day, and what they give their children to eat, I can't not to be surprised.. Every morning I drink smoothie, but these days I'll try all of these ;) Thank you for inspiring me always..
Gorgeous pictures and informative post! 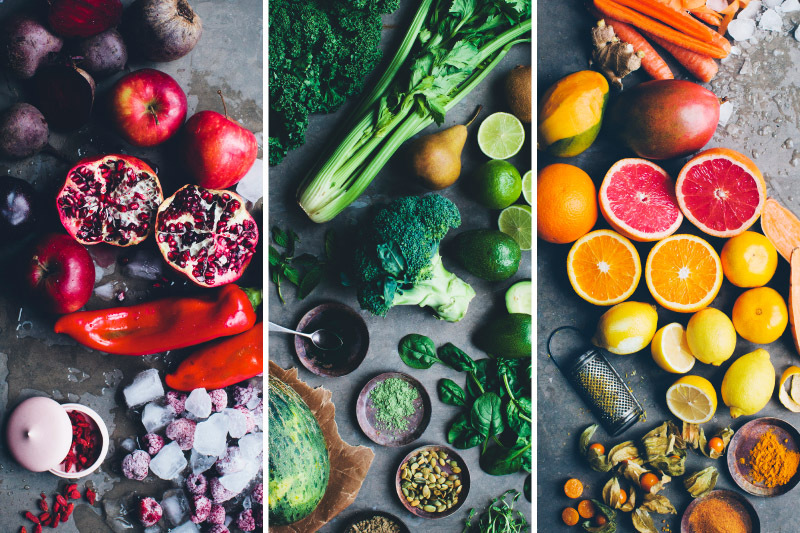 Love the idea of going with colours and nutritional balance. Did i mention? A-m-a-z-i-n-g photography! You guys are taking food photography to a whole new level. AMAZING! This is art. Must... make... NOW!!!!!! All 3!!! !